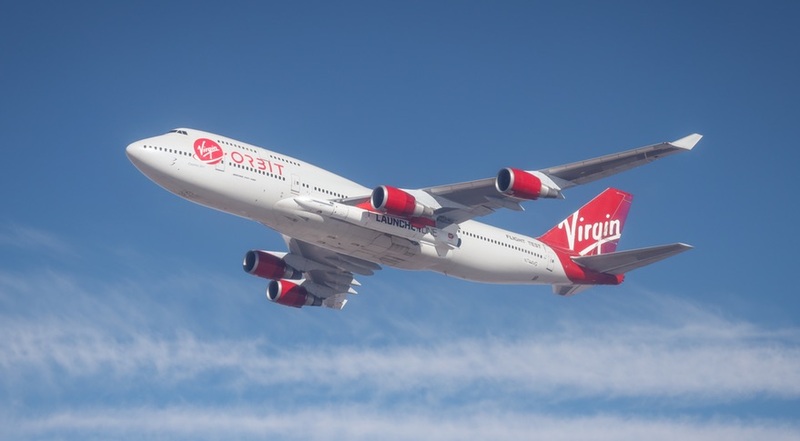 Virgin Orbit’s “Cosmic Girl” 747 aircraft, with a LauncherOne rocket attached to its left wing, takes to the skies in the first captive carry test of the vehicle Nov. 18. Credit: Virgin Orbit. Updated 4 a.m. Eastern Nov. 19 with company statement. WASHINGTON — Virgin Orbit performed the first captive carry flight of its LauncherOne air-launch system Nov. 18, a key testing milestone as the company moves closer to a first flight. The company’s “Cosmic Girl” aircraft, a Boeing 747 with a pylon added to its left wing to which the LauncherOne rocket attaches, took off from the Southern California Logistics Airport in Victorville, California, shortly after 2 p.m. Eastern, according to flight tracking services. It landed back at the airport 80 minutes later after flying above the high desert region of Southern California, including passing over the Mojave Air and Space Port. The flight tracking data didn’t specify if the plane was carrying a LauncherOne rocket, but one eyewitness posted video of the plane taking off from the Victorville airport with a rocket attached. A company spokesperson confirmed later Nov. 18 that this was a captive carry flight, the first for Virgin Orbit. The company had been gearing up for the captive carry test in recent weeks. In late October it announced that it had mated a LauncherOne to the plane for the first time. The company last week posted videos of high-speed taxi tests, also performed in Victorville, where the plane and rocket traveled down a runway at speeds of up to 200 kilometers per hour, simulating an aborted takeoff. During a captive carry flight, the rocket remains attached to the plane. Virgin Orbit said in a statement last month that “a number” of such captive carry flights are planned, “gathering terabytes of valuable data about aerodynamic performance, structural loading, and more.” That captive carry test program will culminate in a drop test, where the rocket is released in flight from the plane but does not ignite its engine, instead falling to the desert floor. Barring any technical setbacks, the drop test will be the final step before the first orbital flight of LauncherOne. The company said last month it had already completed manufacturing of that rocket, with two “fully integrated” rocket stages undergoing static-fire tests in Mojave. The company said in its statement about the captive carry flight that the first orbital flight was now projected to take place in early 2019, with “multiple trips to orbit in the year ahead.” In an interview with CNBC Oct. 9, Richard Branson, founder of the Virgin Group, said he expected the first orbital launch to take place in December or January.